BRSK1 was initially identified as a mammalian homolog to the fission yeast S. pombe Cdr2, a mitosis-regulatory kinase and also shows significant homology to the C. elegans neuronal cell polarity regulator SAD1. 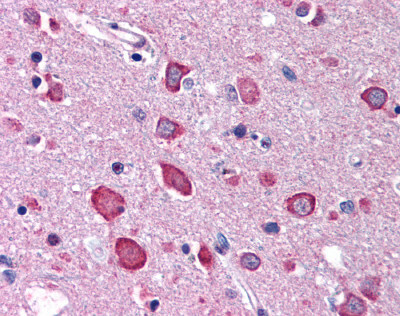 BRSK1 is unbiquitously expressed, with highest levels of expression in the brain and testes. Similar to its yeast homolog, BRSK1 is thought to be involved in stress-induced cell cycle arrest. Overexpression of this protein leads to the G2/M arrest in HeLa S2 cells and UV-induced G2/M arrest could be partially abrogated by reduced expression of BRSK1 through the use of siRNA, indicating its role in DNA damage checkpoint function. More recently, it has been shown that both BRSK1 and the related protein BRSK2 are required for mammalian neuronal polarization. While BRSK1- and BRSK2-null mice were viable, double-mutant mice died within two hours of birth. Neurons from these mice showed uniformly-sized neurites as opposed to the normal long axon and multiple shorter dendrites. These neurites also displayed both axonal and dendritic markers. 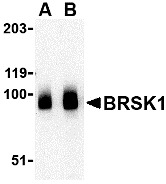 At least two isoforms of BRSK1 are known to exist. Western blot analysis of BRSK1 polyclonal antibody ( Cat # PAB4053 ) in mouse liver tissue lysate ( 35 µg/lane ) . 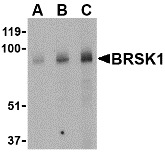 BRSK1 ( arrow ) was detected using the purified polyclonal antibody ( 1 : 60 dilution ) . Western blot analysis of anti-KIAA181 Pab in mouse liver tissue lysate (35ug/lane). KIAA181(arrow) was detected using the purified Pab (1:60 dilution). Immunohistochemistry of BRSK1 in human brain tissue with BRSK1 polyclonal antibody ( Cat # PAB13258 ) at 2.5 µg/ml. Western blot analysis of BRSK1 in human brain tissue lysate with BRSK1 polyclonal antibody ( Cat # PAB13258 ) at ( A ) 0.5 and ( B ) 1 µg/ml. Immunohistochemistry of BRSK1 in human brain tissue with BRSK1 polyclonal antibody ( Cat # PAB13259 ) at 5 µg/ml. Western blot analysis of BRSK1 in human brain tissue lysate with BRSK1 polyclonal antibody ( Cat # PAB13259 ) at ( A ) 0.5, ( B ) 1 and ( C ) 2 µg/ml. Western blot analysis of extracts from 293 cells, using BRSK1 Antibody. The lane on the right is treated with the synthesized peptide. 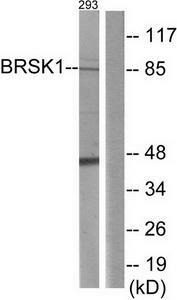 Western blot analysis of BRSK1 in human brain tissue lysate with BRSK1 antibody at (A) 0.5 and (B) 1 ug/ml. 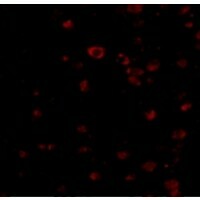 Immunohistochemistry of BRSK1 in human brain tissue with BRSK1 antibody at 2.5 ug/ml. 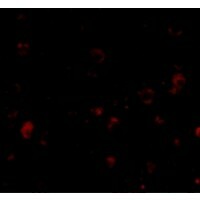 Immunofluorescence of BRSK1 in Human Brain cells with BRSK1 antibody at 20 ug/mL. Western blot analysis of BRSK1 in human brain tissue lysate with BRSK1 antibody at (A) 0.5, (B) 1 and (C) 2 ug/ml. 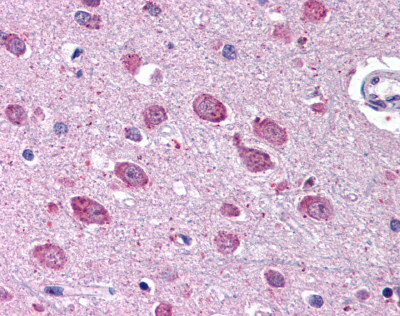 Immunohistochemistry of BRSK1 in human brain tissue with BRSK1 antibody at 5 ug/ml. Western blot analysis of extracts from 293 cells, using BRSK1 antibody.The lane on the right is treated with the synthesized peptide.